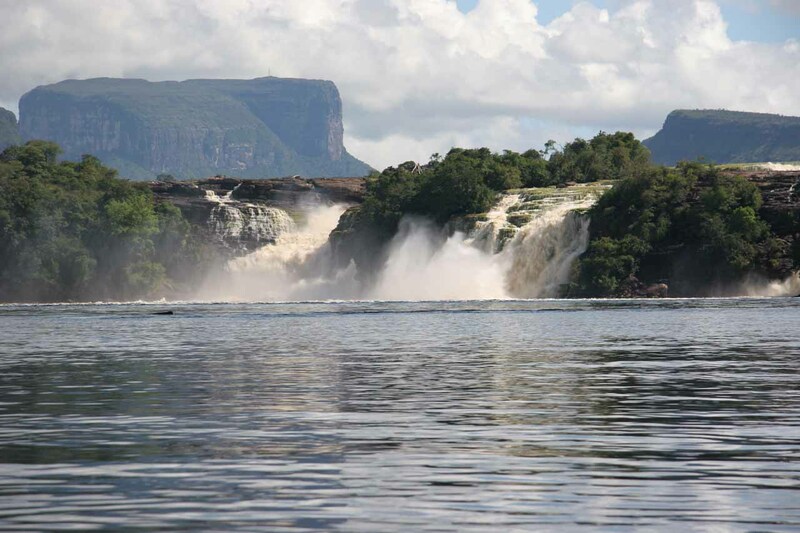 The Canaima Lagoon Waterfalls were a compulsory bonus for us (and just about all visitors) as we entered the indigenous village of Canaima while bound for the world famous Angel Falls. 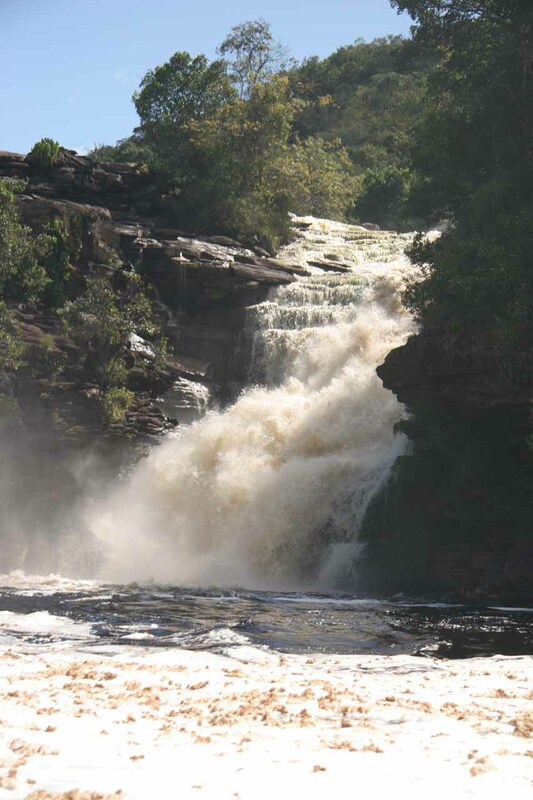 We were able to see this series of waterfalls from the air just as we were about to land in Canaima. 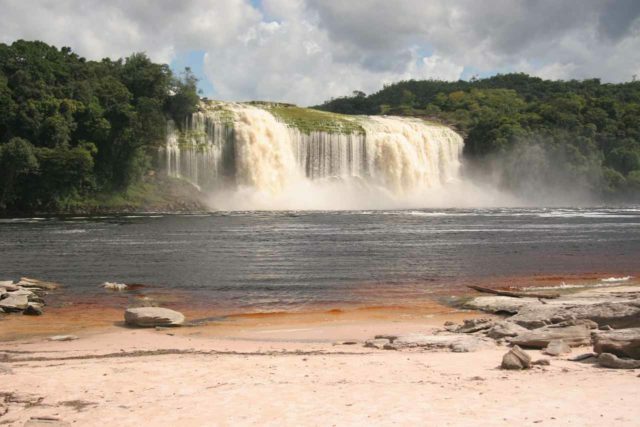 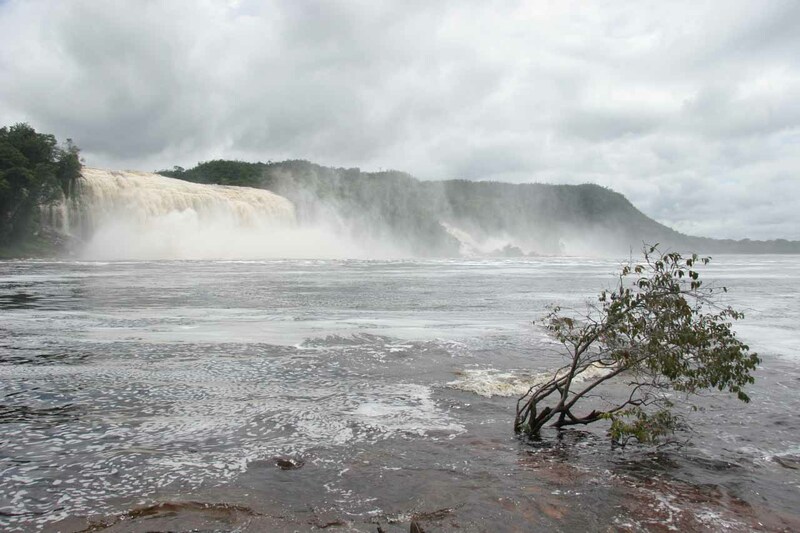 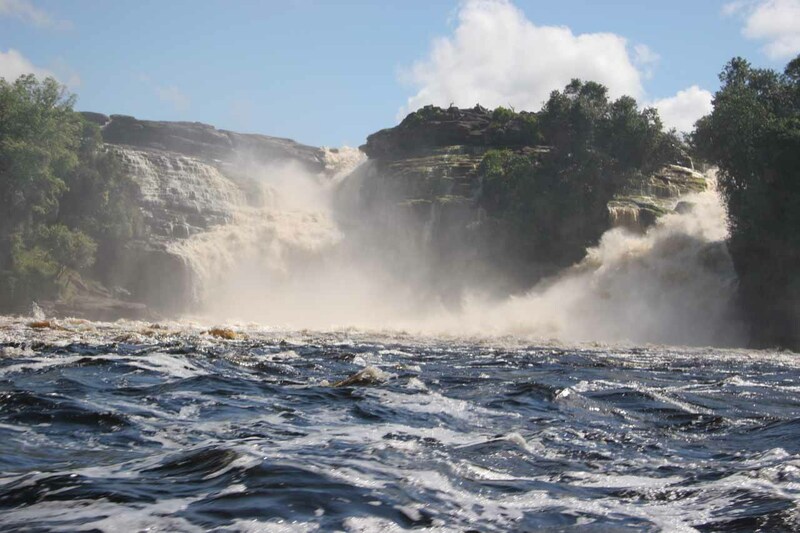 Then, we were also able to see these falls from across the shores of the Canaima Lagoon (La Laguna de Canaima) as well as from up close as we were both in our campamento (camp) as well as transporting to and from it. 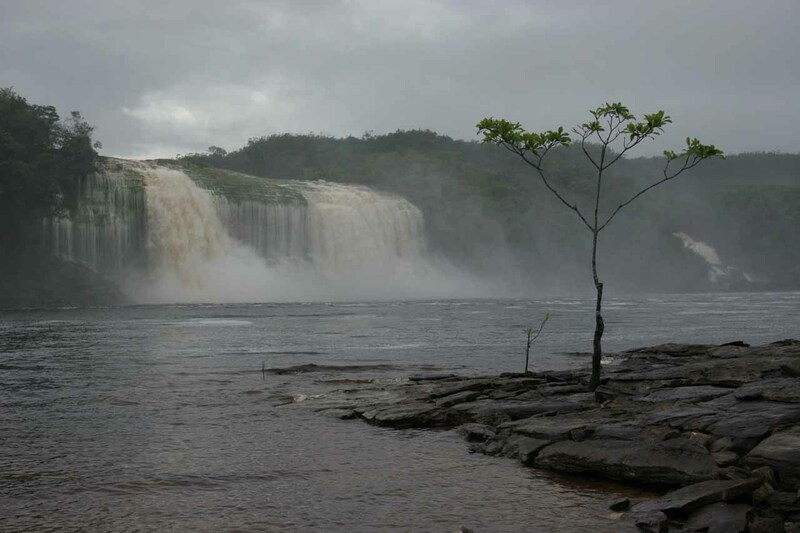 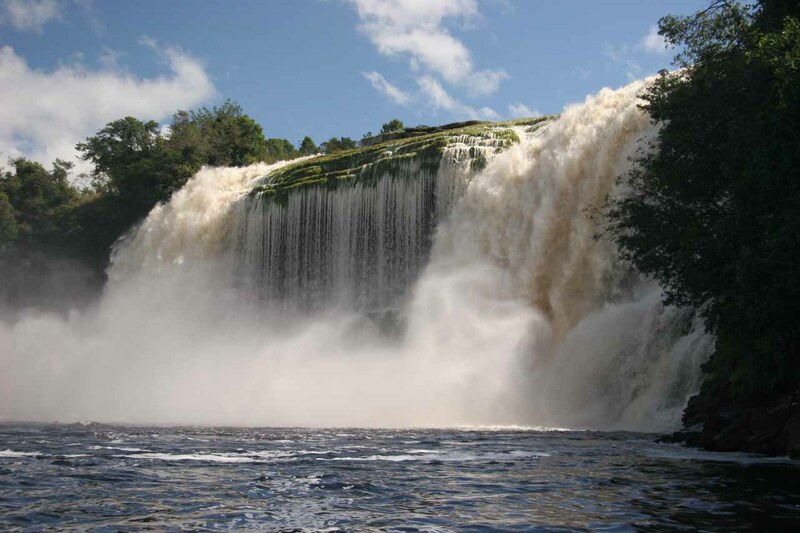 From what we could tell, the cluster of powerfully wide waterfalls on the Carrao River (El Río Carrao) consisted of Salto Ucaima, Salto Golondrina, Salto Wadaima, and Salto Hacha (otherwise referred to as Ucaima Falls, Golondrina Falls, Wadaima Falls, and Hacha Falls in English). 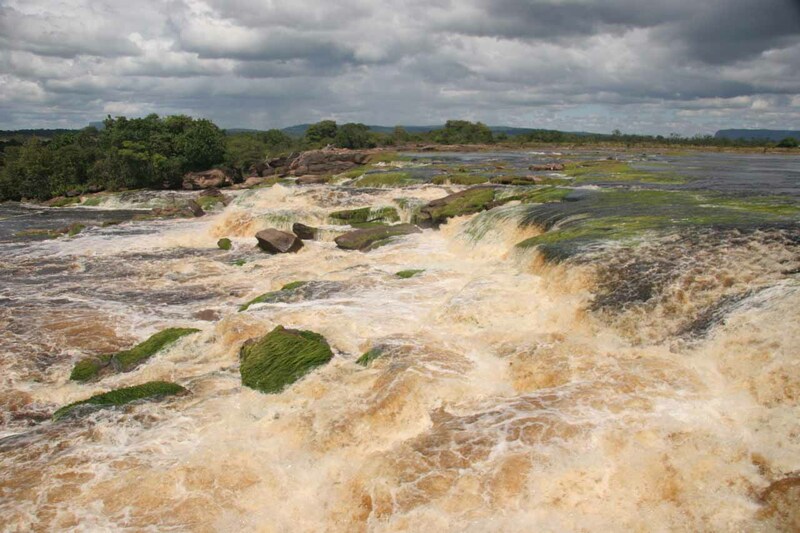 There were also other rapids nearby such as Salto Ará though we were only able to see its mist rising above its top far in the distance of our camp. 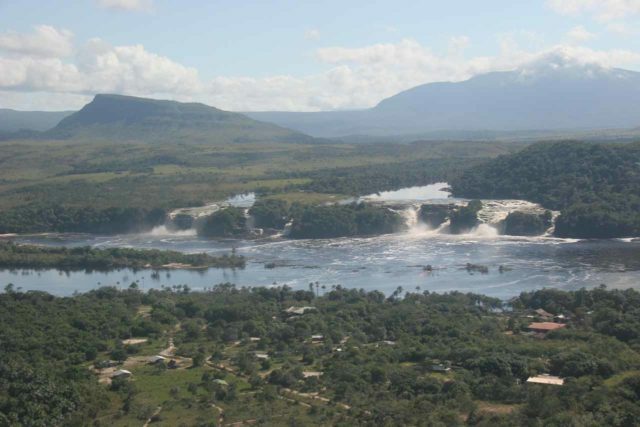 In terms of orientation, Salto Ucaima was the one nearest to Canaima village while wide Salto Hacha was the furthest from the village. 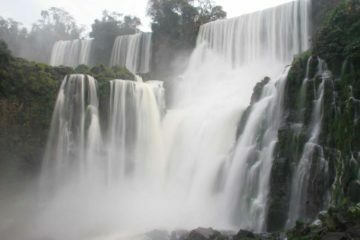 We thought the most attractive of these waterfalls was Salto Hacha, which fell widely and was constantly in view from our camp. 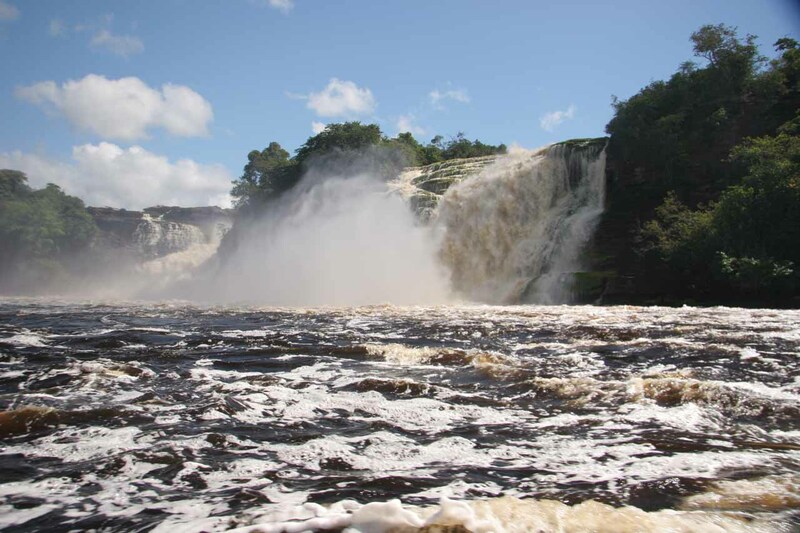 Since we happened to be here when we experienced consecutive days of heavy overnight rainfall, we witnessed the transition of the state of the river, which in turn caused Salto Hacha to grow from a nearly segmented dual plume into a very wide thunderous torrent. 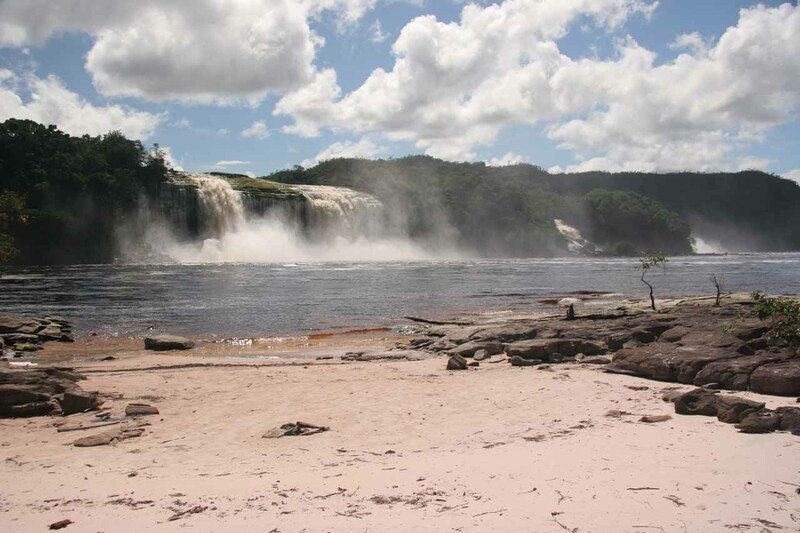 We met a Norwegian group who were camping with us, and they managed to go behind this waterfall on their own from our camp. 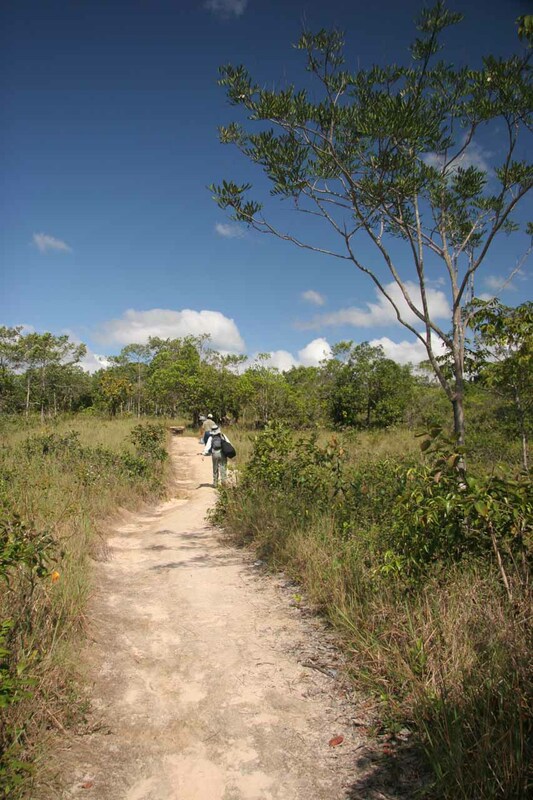 They said there were parts of the trail that were built up and I did notice what appeared to be some steps or other kinds of trail infrastructure near the falls from a distance. However, this involved wading in parts of the lagoon, and we were told that the locals typically didn’t endorse this activity given the degree of risk without a guide. 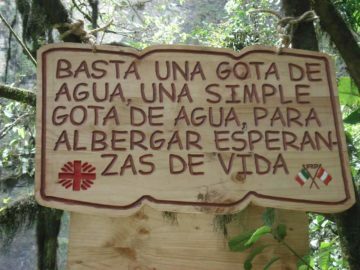 Meanwhile, Salto Ucaima was said to be marginally tapped for local hydroelectricity. During a quick tour of the indigenous Canaima village, we were able to walk past the village and towards a lookout (mirador) right at the brink of its drop. 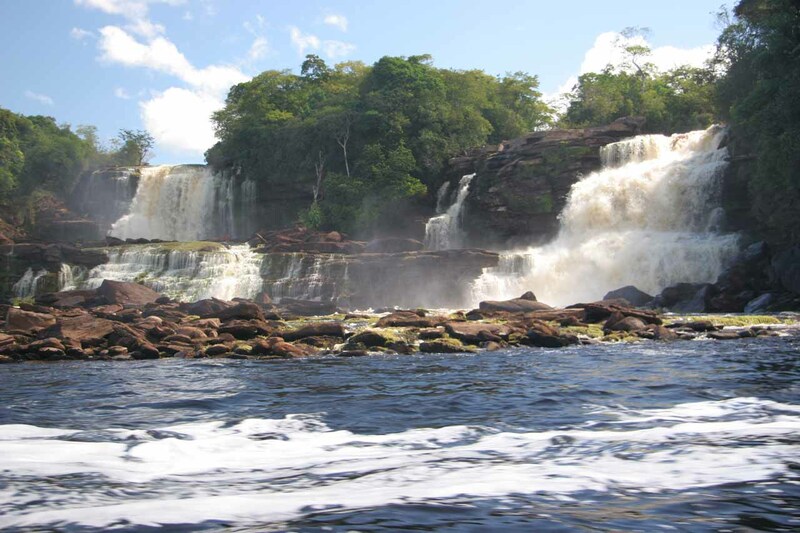 While this view allowed us to better appreciate the power of the river from a relatively safe spot, the only way we could get frontal views of it were from the boat when we were shuttling across the lagoon from village to camp and back. 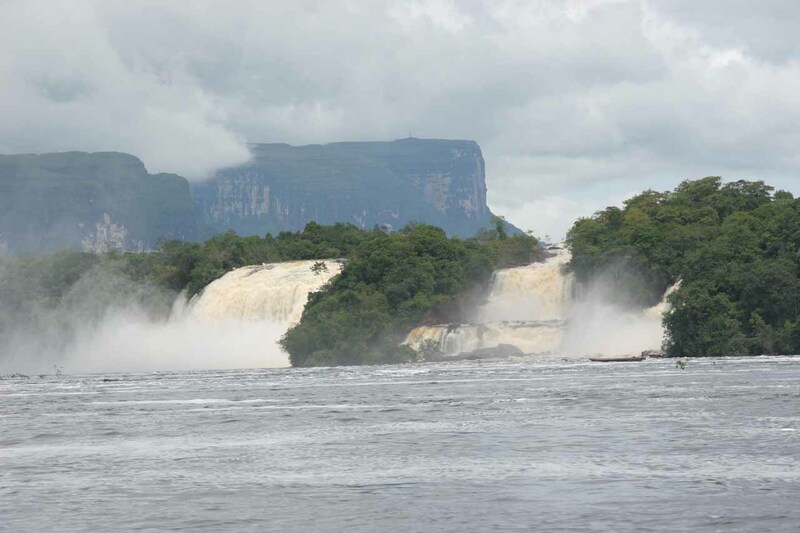 The remaining Canaima Lagoon Waterfalls between Salto Ucaima and Salto Hacha could only be seen directly by the boat transfer or from the air, which we alluded to earlier. 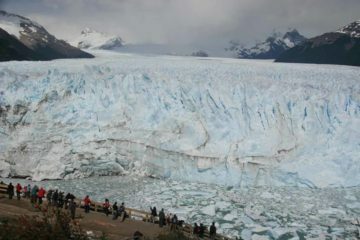 We were also able to see them partially from camp, but not a whole lot of them given the severe angle (as pictured a few paragraphs above). 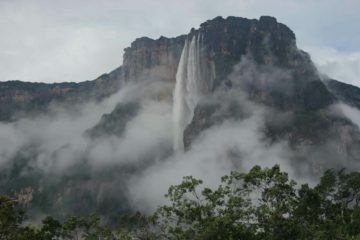 We were able to experience this waterfall automatically as part of our tour to Angel Falls. Planes would land in Canaima where it’s possible to walk around town up to the brink of Salta Ucaima. 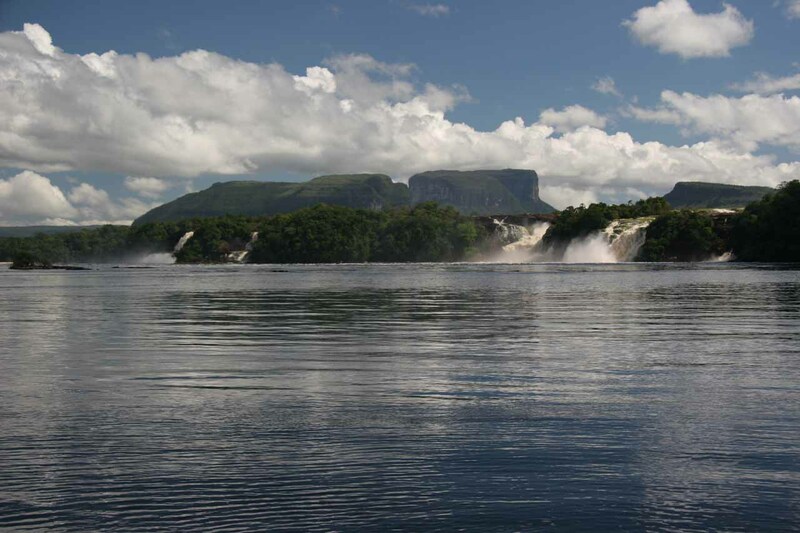 However, our tour took us across the lagoon where we crossed in front of all the main Canaima Lagoon waterfalls since our camp was on the opposite end of the lagoon from Canaima village. 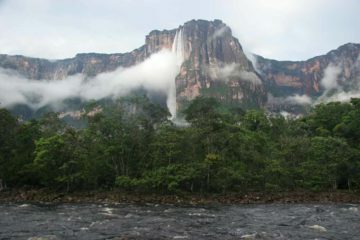 For the manner in which we reached Canaima, we did a writeup about the logistics of our trip to Angel Falls, which you can read here. 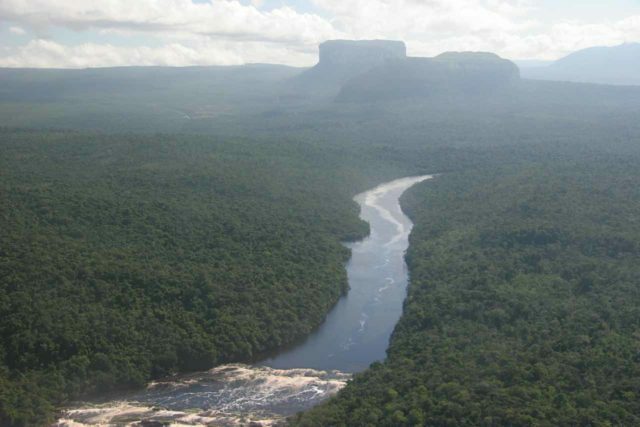 As for geographical context, Canaima was roughly a 75- to 90-minute flight from Ciudad Bolívar or Puerto Ordaz. 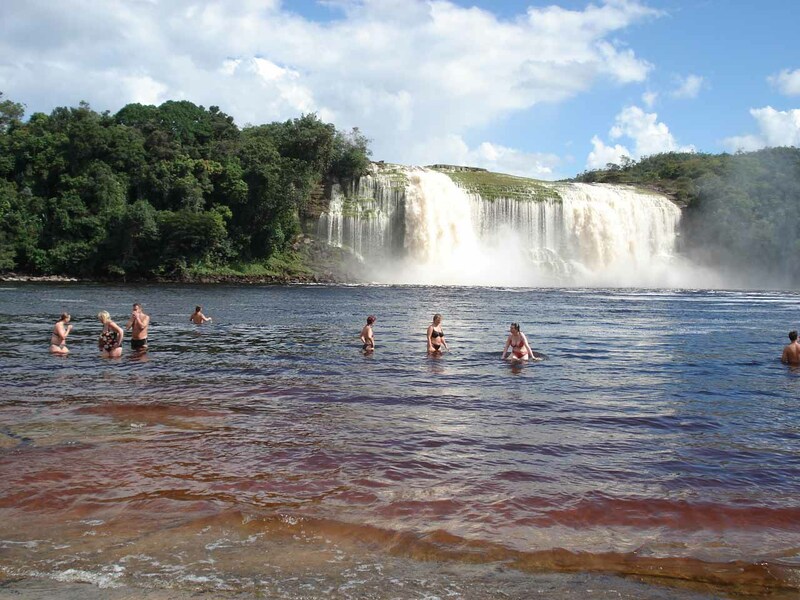 Both of these intermediate cities are roughly 2 hours flight from Caracas.